Pemra’s new proposals including content regulation, restrictions on live coverage, formation of editorial board, reporting on sub-judice matters, coverage of terrorism etc. have generated a debate in the political and media circles. It’s probably the second such attempt by the present government in the last four years since former Information Minister Sherry Rehman refused to implement a similar action and quit the ministry. 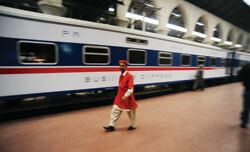 Travellers are generally satisfied with Business Express, the new private-public initiative in train service. But will it be able to sustain itself? Sehrish Khan, a Karachi-based distributor of pesticides, reclines on a spacious chair in the Pak Business Express lounge at the Lahore Railways Station as she waits for a relative to come and pick her up. A slap in the face is not meant to hurt physically as much as to inflict scorn and humiliation on the person receiving the slap. In that sense it is like spitting at someone publicly, showing the whole world the despicable nature of the person spat on, and the awesome power of the one spitting. 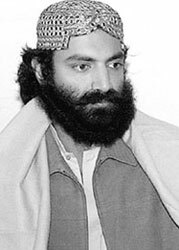 In one of the numerous talk shows on a private television channel recently, the self-exiled Baloch tribal chief Mir Suleman Dawood Khan thrice said “Inshallah” when the female host of the programme asked him whether he and his supporters no longer wanted to be part of Pakistan and were hoping to establish an independent state of Balochistan. The violence which wracked the western Indian state of Gujarat ten years ago has almost become a metaphor for a particular aspect of India’s contemporary reality. The metaphor is described differently, depending on whether one is a supporter of Gujarat’s Chief Minister Narendra Modi or an opponent. The Pakistan People’s Party (PPP) and its allies have converted an ostensible political peril into political profit by successfully crossing the bridge of Senate election-2012. The initial reaction from the media has forced the government to review the decision; Pemra has now decided to send the proposal to the Pakistan Broadcasters Association (PBA), ignoring other stakeholders like journalists as well. 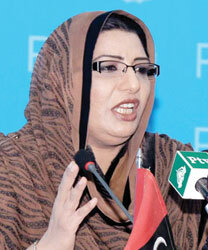 Federal Information Minister Firdous Ashiq Awan denies the government has any intention to suppress the media but is believed to have backed the move by the Pemra. One wonders why there is no council of complaint or code of conduct for the state-run PTV, Radio Pakistan and Associated Press of Pakistan (APP). Why is there no editorial independence for PTV, radio and APP and no independent body to look after their affairs? Pemra Chairman Dr Abdul Jabbar said they had received at least 800 complaints against the media, which they will make public in a week. But even if there were 8,000 complaints, the journalists will never allow outside interference in the editorial policies of the channels. Every channel has the right to have its own editorial policy of news and programming; it can’t be run on dictation from outside. In 2005, while appearing before the Parliamentary Committee on Information as Secretary General of the Pakistan Federal Union of Journalists (PFUJ) to discuss the Pemra Ordinance, my contention was that such bodies have often been used to gag the press and Pemra would be no different. PFUJ stand was that Pemra should not have been given powers of regulation but it should only be the license-issuing authority. We also demanded that Pemra should be an independent body and its chairman should not be appointed by the president but by the prime minister in consultation with the leader of the opposition. In November, 2007, former President of Pakistan General Pervez Musharraf used Pemra to pressurise media-owners and, after the ban on channels, forced the owners to agree on a clause in the code of conduct, prohibiting any criticism on the president. The dilemma of the Pemra managers over the years has been the lack of knowledge of Pemra’s own rules (the officials have been more busy ensuring the coverage of ministers, particularly the federal information minister rather than studying the rules). Their managers often include retired or sitting police officers rather than people from the media or at least those who understand the media. The police officers used their muscle during Musharraf’s emergency by raiding the media offices; FM radios became their worst victims. Pemra’s recent outburst was about the undue media coverage to alleged separatist Baloch leaders by several prominent tv anchors in which they had blasted the government and even declared their “anti-Pakistan stance”. Media must prepare itself for facing the charge of ‘sedition’ as warned by the Pemra media managers. But the first such case should be registered against the Federal Interior Minister Rehman Malik who not only announced withdrawal of all cases against the exiled Baloch leaders but had also admitted to having met one of them in London. Unlike in 1971, when the print media not just failed in its responsibility but became a tool of the establishment as the Pemra wants electronic media to be now, the independent media’s approach is the country may lose another province if not given its due rights. Then, the media was held responsible for not highlighting the plight of Bengalis and the atrocities committed by the army. Today, Pemra on the behest of the government and may be some other forces, too, is advising us not to show the plight of the missing persons, not to warn that we are losing yet another part of the country, not to interview people who are angry and not always for the wrong reasons. What we are doing now should have been done 40 years back. Suppression and repression have always been counter-productive. I have seen most of these talk-shows and have found almost all anchors quite sober while discussing Balochistan with the Baloch hard-line leaders. Surprisingly, Pemra has not taken notice of the tv coverage of the Defence of Pakistan Council, which includes some banned parties as well. Till a few years back, we were not allowed to air the speeches of leaders like Hafiz Saeed and Fazlur Rehman Khalil, but now there is no pressure not to cover them. It may be good news for the tv channels that they are not facing the pressure but the reason why Pemra is not sending any notice now is something else. Editorial control and content control is the responsibility of media managers, not Pemra managers. They must refrain from issuing such notices without seeking instructions from the Council of Complaints. Pemra insists that all these regulations or guidelines will be in accordance with the complaints they got from the public and the civil society. But, under Pemra’s own rules, these complaints should first go to the Council of Complaints, which includes representatives from the civil society, lawyers and people from a cross-section of society. In fact, the Council of Complaints should take notice of the fact that it is not the responsibility of Pemra officials to ask tv channels for the coverage of information minister. It is simply not in their domain. The other major objection of Pemra is about media’s reporting and debate on court cases (mainly political and relating to corruption). They want media to avoid debate on sub-judice matters, pending in court, but this objection must come from the court itself. 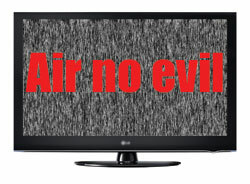 The media managers had already decided in 2010 that they would: (1) avoid depiction of blood and gore; (2) carefully handle the live coverage of encounters between police or law enforcement agencies with the terrorists or criminals; (3) not portray alleged terrorist as hero; (4) avoid use of abusive language, either by the host or guest. There were many other clauses and by and large media has followed these guidelines. In Pakistan’s turbulent political history, today’s terrorists were jihadists of the past, today’s patriots were terrorists of yesterday, today’s heroes were yesterday’s villains. So it is not possible for the media to toe the line of the establishment. Yes, the media has to be responsible and there are no two views about it. But most of the complaints against it are due to lack of training and professional skill. For instance, I fully endorse doctors’ concern that cameramen or media team must not enter hospitals’ operation theatres or Intensive Care Units. It’s very important that doctors are not disturbed while treating the injured. The solution is that one spokesperson of the hospital should be present outside to answer the media queries. This way, the media will get the official quotes about the dead and the injured and their condition. The spokesperson can allow the cameramen to take visuals only after getting permission from the concerned doctor. Now this issue was not addressed by the Pemra though it’s an issue of public interest; not perhaps of government’s interest. Similarly, Pemra wants respect for privacy. It should be noted that this issue was highlighted first by the social media. The media is well-aware of privacy of an individual but when it comes to public servants or public representatives it becomes debatable because they are supposed to set moral standards. However, if they are doing something in private, the media should let them be. I agree with Pemra’s spokesman that it should not be criticised for performing its functions, but what if it violates its own rules while issuing notices, most of which are general in nature. There are a lot of problems within the media and the media stakeholders must sit and resolve these issues. But the government of the day must not attempt to suppress the media in the name of regulation. The writer is a senior journalist and former secretary general of the PFUJ. A frequent traveller to upcountry destinations for both family and business visits, this is indeed a unique experience for her. Her relative, who is on his way to the station, is not behind schedule; in fact the train, Pak Business Express, has arrived almost half an hour ahead of its expected time of arrival. It’s her first trip on this executive train launched through public-private partnership (PPP) and the experience in her words is “wonderful”. Sehrish travelled in budget class where one-way ticket cost Rs3,500, and intends to travel in business class on return journey to Karachi, which will cost Rs5,000. The main difference in the two classes is that the travellers in the business class enjoy free WiFi and catering by Pearl Continental Hotel whereas the budget class travellers can bring their own meals or buy them onboard. No doubt there has been enough praise for the initiative and scepticism, if any, is mostly about the fears of its discontinuation. The fears are not unfounded, especially in an environment where any innovative move is seen with suspicion. The news about delay or shortfall in payments by Four Brothers — the private partner in the project — has given strength to the sceptic thought. However, the investors’ point of view is that they will be able to clear all outstanding dues this month when they expect the train will run on full capacity. One of the reasons for less than expected or desired occupancy is that the private partners have not advertised the initiative at a mass scale and resorted to a soft launch. “May be they were themselves not sure they could follow the timings,” says a railways clerk. Sehrish thinks Rs3,500 is a good price for the ticket as one gets comfortable bedding, pillows, clean drinking water, cleanliness and immediate on-call service. A premier private bus service also charges the same amount for Karachi-Lahore travel but the levels of comfort are not comparable at all, she admits. Sehrish tells TNS she had set the wakeup alarm for 9.30am when the train was expected to arrive at the Lahore train station. But she had to woken up by the staff as the train reached half an hour before the scheduled arrival. Shahid Ghani, a foreign education consultant based in Lahore, has revised his plans to attend a family marriage in Karachi. Earlier, he was supposed to fly alone but now he is thinking about taking his wife and three children along as well. He tells TNS the total cost of return travel on budget class for the whole family will be around Rs 30,000. This amount is almost the same the PIA charges for a single person’s return journey from Lahore to Karachi, he says, adding children are charged 70 per cent fare. For Shahid, punctuality, affordability and ease of travel are a must. Therefore, he regularly gets feedback from business train travellers and plans to take up journey only if the response remains continuously positive. Ijaz Ahmed, Chief Operating Officer of Pak Business Train, says occupancy is an issue but it is increasing gradually. He expects the numbers to rise with warm weather setting in, as the train is centrally air-conditioned. He is content with the fact that the train has got late only once since its launch on Feb 3. The train stood long hours due to blasts on the track but was able to cover for most of the time loss, he says, adding all the passengers were given free vouchers worth Rs1,000 as compensation. They can avail these vouchers on their next journey. The train is the brainchild of four brothers, two of whom were presidents of the Lahore Chamber of Commerce and Industry (LCCI). Abdul Hameed Razi, director at Pakistan Railways, says they are making utmost efforts to ensure that business train’s operations run smooth. The quality of service is the responsibility of the private partners and operational responsibilities lie with them, so he says, they have to stick to the commitment. However, there may be reasons beyond control like strikes or natural calamities that could halt the operations. Razi adds the launch of the Shalimar Express by another private party has triggered competition within the private sector that is good for the consumers. The organisation is also assessing whether the private party has invested the committed amount of Rs 220 million on the renovation and up-gradation of the train or not, he adds. Children get slapped when older people want to exert their control and to humiliate them into accepting their place as dependents. Adults slap each other for exactly the same reasons. Like a policeman stamps his authority on a suspect by hitting him hard on the cheek before saying wa alakum salam. Or a man slaps a woman as a reminder of the limits he has imposed on her and of possible consequences of breach. Or a well-fed man or woman whacks a domestic servant or shop assistant once a week, just as a precaution against them getting wrong notions in their head. It’s always between the strong and the very weak, which is why there is seldom retaliation. The slappers have figured correctly that if you pick your victim carefully, they may or may not fall down to their knees but none will dare react immediately. And slap some one routinely, long enough, and they’ll remain loyal and obedient all their lives, and their next generation’s lives. For instance, Pakistanis. There’s this joke about a despotic king who was deeply unpopular with his subjects on account of his excessive cruelty. He got in his head to be remembered as a ruler known for his justice. He hung a Justice Bell in his majlis and told his prime minister he was now ready to see justice seekers. The PM panicked. He knew people hate the king, and are scared to death of a mere mention of his name. They won’t find the courage in them to bring a complaint to the sovereign. To give them incentive, he announced the taxes to be doubled. A few days later, mobile phone call charges were doubled. A couple of days later, sale of chocolate and ice cream was banned. Still no complainant. In his desperation the PM ordered every man and woman entering the city for work in the morning, to be stopped at the gate, made murgha, and whacked ten times on their bottoms with a new standard issue Oxford shoe with hard shining sole. That worked. A man trembling with fear approached the king and rang the bell. ‘My king all is well in your kingdom and we all pray for your long life, except there is a small favour that I am here to beg on behalf of everyone. During the morning security checks we have to stand in queues for hours, and are often late to work. Would the generous king order the security staff to be doubled? Sounds familiar? Actually, what would sound more familiar is ‘order the security staff to be doubled, and for that we are ready to accept 20 lashes daily instead of 10’. We Pakistanis have a high threshold of humiliation, owing to a constant whacking by the state. Like, allowing and facilitating American agents to hunt, capture and take away Aimal Kasi from DG Khan; handing over of Afia Siddiqui and her children into US custody; letting US forces to attack a compound in Abbotabad … and through its own rubbishing of its people, prompting an American lawyer arguing against giving out millions to Pakistanis who helped with the arrest of Kasi, saying, Pakistanis will sell their mothers for a few dollars, why waste so much money on them! None of this shames, or even embarrasses us. The latest incident in Sindh however, just may. 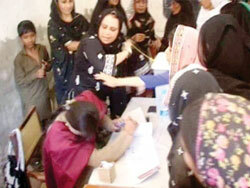 A PPP candidate for a provincial seat in Tando Mohammed Khan, a woman named Waheeda Shah, was shown by TV cameras slapping the polling staff squarely in the face at one of the women’s polling stations, while a police officer and scores of staff and voters looked on. But that’s not the incident I refer to. The more degrading and painful slap came the next day, when the victims appeared with Ms. Shah at a news conference to say the slapping was all a mistake and they have no hard feelings against the psychopath candidate who’d been by then declared the winner. The question that wasn’t asked of victims was what will make them have hard feelings? Made to enter their office every morning, murgha walking, while the naib qasids hit their raised bottoms with Kohati chappal all the way? This would have been unimaginable in the past but the Khan of Kalat, the title of Mir Suleman Dawood as the top Baloch tribal chief, was able to talk about secession because he was based in the United Kingdom and, therefore, beyond the reach of Pakistani law. Besides, the unprecedented freedom presently enjoyed by Pakistan’s lively media enabled him and many others to freely discuss issues that were once a taboo. In fact, the discussion on the Balochistan issue in recent days on the private television channels became so intense and, at times, wayward that the Pakistan Electronic Media Regulatory Authority (Pemra) stepped in, issued a reminder about the limits of media freedom and warned that the law should not be breached. Even with an independent media, it would not have been possible for the Khan of Kalat to publicly advocate independence for Balochistan as long as he lived in Pakistan. Having received political asylum in the UK, he is able to say whatever he wants. From his new home in Cardiff, he has been campaigning for independent Balochistan and frequently travelling to London for meetings. He has also been visiting other European capitals to lobby support for his cause. Some of his meetings with US Congressman Dana Rohrabacher led to the drafting of the resolution that the 12-term member of the House of Representatives from California recently tabled to demand the right of self-determination for the Baloch people. One by one Baloch nationalist and separatist leaders have been leaving Pakistan and surfacing abroad, mostly in the Western countries, and gaining freedom to openly talk and campaign for an independent Balochistan. The latest to do so was the young Bramdagh Bugti, who turned up in Switzerland some months ago and applied for political asylum. In fact, he made public his presence in Geneva by giving an interview to the New York Times. There is no doubt that Bramdagh would be granted political asylum in Switzerland. By allowing him to enter Switzerland, the Swiss authorities were intending to view his case favourably. Indeed, he has a strong case because he surely would face persecution in Pakistan after having rebelled against the state and by openly advocating independence for Balochistan. Despite denials by him and his supporters who claimed he was somewhere in Balochistan commanding his fighters all these years, he was already living in self-exile in Afghanistan. The government of President Hamid Karzai had given him refuge like many other Baloch separatists as revealed by WikiLeaks, but it was uncomfortable hosting him and earning the displeasure of Pakistan. Thus a way out was found and Bramdagh was sent to Switzerland. Bramdagh crossed over to neighbouring Afghanistan sometime after his grandfather Nawab Akbar Bugti was killed in a military operation ordered by President General Pervez Musharraf in August 2006. The 29-year-old Bugti tribal chief is the youngest and one of the most hardline among the self-exiled Baloch nationalists. Though he refrained from talking about an armed struggle against the Pakistani state in his New York Times interview and instead highlighted his political struggle for Baloch rights apparently to avoid complications pending his application for political asylum in Switzerland, his views about seeking Balochistan’s separation from Pakistan are well-known and a matter of record. This became apparent when he recently spoke on the phone to journalists in Quetta by welcoming the introduction of the bill in the US Congress supporting the right of self-determination for the Baloch people. Bramdagh was also quoted as saying that the time for holding all-parties conference on Balochistan proposed by Prime Minister Yousaf Raza Gilani was over, justifying attacks on the security forces and even settlers by arguing that the Baloch people were the target of atrocities committed by the state. He also dismissed the development packages announced by the government for the province as too little, too late. More importantly, he declared that the Baloch would be willing to accept help from anywhere, including India and even the Satan, to defend themselves. Going by Bramdagh’s tough statements, it would appear that he and his supporters have made up their mind to rule out Balochistan remaining a part of Pakistan and instead strive for its independence. 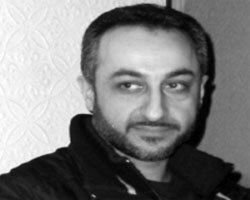 Another leading proponent of this idea is Hyrbyar Marri, the son of veteran Baloch politician Nawab Khair Bakhsh Marri, and his borthers. Hyrbyar has been granted political asylum in the UK after a lot of wait and effort and also a stint in prison. The Bugti and the Marri tribal chiefs are also related by inter-marriages and are now strong allies in the fight for independence, though in the past Akbar Bugti was often in the pro-government camp unlike the Marris and the Mengals. Like other nationalists, Hyrbyar would like all the Baloch to unite as he believes artificial and arbitrary international borders have split his nation, but he is realistic enough to understand that it isn’t a possibility at this stage. In his view, Greater Balochistan presently is unachievable and could even be a conspiracy. His focus is on Pakistani Balochistan and his immediate goal is turning it into an independent state using every means. He does maintain links with the members of the Iranian Baloch community and sympathises with their cause. Mir Suleman Dawood, however, is a forceful advocate of the idea of Baloch unity. If he had his way, he would like to unite all the Baloch living in a number of countries of the region and totalling an estimated 12 million. In his capacity as the head of all Baloch sardars, or chiefs, he sees his role as a father figure descending from the Khans of Kalat who ruled the Kalat state of the Baloch people. He is seeking to keep the dream of creating an independent Baloch state alive even if it looks unrealistic at this stage. As Baloch also live in considerable numbers in Iran and many Baloch are found in Afghanistan, his task of making it happen is all the more difficult as such an independent state of Balochistan would come into being only after dismembering not only Pakistan but also Afghanistan and Iran. The resolution that Rohrabacher moved in the US Congress also refers to the Baloch in Afghanistan and Iran and is thus close to Mir Suleman Dawood’s heart. Apart from the Baloch sardars mentioned above, there are many other Baloch political workers, intellectuals and those in the diaspora working for an independent Balochistan. Most are based in the West and some are in the Gulf countries. Abdul Wahid Baloch, Munir Baloch, Sabir Baloch and many others are active on this front, but the lack of unity in Baloch ranks has rendered them weak and harmed their cause. The support from the few US Congressmen and some intellectual backing for the Baloch cause in the American think-tanks and media has brought the issue into the international limelight. This has also made the Pakistani establishment to arise from slumber and devote attention to Balochistan. Though the Baloch separatists and most nationalists are no longer willing to talk to Pakistan’s ruling elite and have been inflexible in their approach after receiving some international backing, particularly in the US, the increased global attention on Balochistan should prompt the Pakistani state to work even harder to remove the grievances of the Baloch people and prevent yet another dismemberment of the country. One part of that metaphor is surely the organised killings of 2002 and the subsequent decade long politics of brazen communal mobilisation which have come to define Modi’s politics and, perhaps, even Gujarat. Modi supporters range from those who are proud of the killings to those who make apologetic noises but find excuses to water down the gravity of the crime. These killings and the continued violence, both physical as well as indirect and invisible, have been highlighted endlessly by those who support justice and communal harmony but has done little to dent Modi’s political support, which extends well beyond Gujarat to include leading lights of Indian capitalism and a fawning urban middle class who are voluble cheerleaders for Modi’s campaign to become India’s prime minister. These killings and the subsequent unrepentant bravado show him to be someone who can and will subvert every institution of State through his divisive agenda to further his politics. However, for most of his supporters, his role in these killings and subsequent refusal to even reconcile are an illustration of his qualities as an “iron-man” who does not waver in the achievement of his goals. What has successfully been projected as Modi’s aim is the economic development of Gujarat which has found acceptance even among those who remain strongly critical of his role in the 2002 killings. It is now widely accepted that Gujarat under Modi has become a leading destination for capital investment and if there were any doubts about the 2002 violence reducing investments and economic activity, the past decade has laid that to rest. Those opposed to him point to the exaggerations and the spin in this story of economic growth and highlight the presence of major inequality, poverty and destitution in the state. Let’s go back a bit in history to understand how and why Modi became a metaphor for India’s quest for development and modernity. A decade ago Modi was a relatively minor BJP leader when he was parachuted into the Gujarat chief minister’s chair to try and stem the electoral/political slide of the Bharatiya Janata Party in the state. With elections just about a year later, many commented that Modi had been dumped with the job no one wanted — to oversee the defeat of the BJP in the state elections. It is a testament to his political prowess that he planned and implemented an almost impossible turn-around in the fortunes of the BJP in Gujarat. The polarisation resultant from the 2002 killings helped him win the election that year but his subsequent victories have been due to the powerful social bloc he has welded into a political support base. Modi’s success is his ability to bring to a closure the ongoing “counter-revolution” of the upper-castes like Brahmins and dominant castes like Patidar/Patels of Gujarat which began in the 1980s as a reaction to the successful mobilisation of the lower castes and marginalised social groups, popularly termed the KHAM, by the Congress in the 1970s. KHAM stood for Kshatriya (who are a backward caste in Gujarat), Harijan (another term for the former “untouchables” and present day Dalits), Adivasi (tribals) and Muslims. Modi’s success has been to provide an alternative social bloc, led by the Patidars and Brahmins, which also includes the Kshatriyas and significant sections of the Dalits and Adivasis. Hindutva provided the glue which brought the divergent socio-economic interests of the Brahmins and Patidars together with those of the upwardly mobile lower status groups. However, the welding of these divergent interests into one solid social political bloc was enabled by the ability of the upwardly mobile sections of the Kshatriyas, Dalits and Adivasis to partake of the bounty of economic growth. By its very nature this is a brittle alliance, however strong it may appear. The hatred and violence against Muslims and visceral anger against anyone who threatens to break this cross-class alliance compensates for the brittleness of this social bloc and thus remains central to Modi’s politics. Modi is a metaphor of how the dominant castes and classes can use economic growth to forge an alliance with some social groups whose socio-economic interests do not converge with theirs, on an agenda which reinforces the former’s dominance. Unfortunately for the BJP, and the various industrialists and middle class fan-boys of Modi, this is a feature unique to Gujarat and unlikely to be successfully replicated in other states, as the electoral history of the past decade illustrates. Unfortunately for the victims of Modi’s model, this political social bloc seems solid for the next elections in Gujarat at least and thus makes justice and reconciliation nearly impossible outside of the strictures of the higher judiciary. Prime Minister Yousaf Raza Gilani and many other leaders had publicly attributed all conspiracies, including ‘judicialisation of politics’ and ‘securitisation of politics’, to Senate elections. Now the situation is clear with two loud messages: first, the PPP has consolidated its position in the territorial chamber and will be a single largest party in the Upper House after 1977; second, the emerging Pakistan Tehreek-i-Insaf (PTI) will have zero representation in the Senate even if it performs well in the next general elections. Therefore, the PTI would have to make compromises for any piece of legislation in the parliament. In the Pakistani federal system, the territorial chamber has been evolving significantly — in 1973, it started with 45 members while in 2012, it will have 104 members as four seats have been reserved for religious minorities through the 18th Amendment. Here it is pertinent to mention that the PPP was the only party that facilitated members of minorities namely Senator Ratna Bhagwandas Chawla in 2006 on a woman seat and Senator Khatumal Jewan in 2009 on a general seat in the Upper House. March-2012 onward, religious minorities will have constitutionally protected representation. The 18th Amendment has also empowered the Senate by making the prime minister and the cabinet answerable and responsible to the Upper House along with the National Assembly. It also assigned the Upper House a role in the new mechanism for appointments to superior judiciary and formulation of an independent Election Commission. And now the 20th Amendment has also given it a role in the appointment of neutral caretakers. After the 18th Amendment, it has been made a constitutional obligation to lay before the Upper House an annual report on implementation of Principles of Policy, Council of Common Interests, National Economic Council and a bi-annual report on National Finance Commission for debate and discussion. Similarly, now a presidential ordinance can’t be promulgated when the Senate is in session and it is entitled to disapprove any ordinance. The amendment also gave role to the Senate to separately endorse Emergency, if it is imposed. Many political parties yearn for the role of Senate in approval of the national budget, but it remains a distant dream. Presently, it can only discuss it for 14 days and come up with non-binding recommendations. However, it has established its role in legislation, constitutional amendments, and presidential election/impeachment. Up to twenty five per cent share in the federal cabinet is another aspect of the Senate. Coming to Senate Election-2012, insiders claim that the PPP was able to convince the leadership of the Pakistan Muslim League-Nawaz that smooth Senate election will counter the “establishment’s cards” to manipulate the next general elections and engineer favourable environment for its potential new horses. However, the “reconciliation mantra” worked only on nine seats out of 54 at stake. Of these nine un-opposed senators-elect, five are from Punjab. A PML-Q dissident, Mohsin Leghari, earned the right of vote for Punjab legislators for seven general seats. 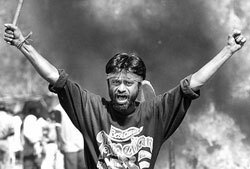 In Sindh, Arbab Rahim spoiled the broth as he wanted to be designated as Leader of the Opposition and only two senators were elected un-opposed on technocrat seats there. However, two seats from the federal capital have been won by the PPP and the PML-Q unopposed. Interestingly, the highest number of candidates was recorded in Balochistan, where the nationalist parties are out of the contest. Here, the PPP missed a reconciliation opportunity to keep those nationalists from Balochistan in the federal parliamentary loop that voted for the 18th Amendment, but had boycotted Election-2008 and had no presence in the provincial assembly i.e. electoral college for Senate elections. Among the claimants of Balochistan’s political wealth was also Ramesh Kumar Vankwani, a resident of Mithi (Sindh), who served as member of Sindh Assembly from 2002-7 and shifted his vote to Quetta only two weeks before the nomination. The PPP also awarded ticket to Karachi-based Yousuf Baloch to contest from Balochistan. Equally surprising was the candidature of Barrister Mohammad Ali Saif, spokesperson for General Pervez Musharraf, from Khyber-Pakhtunkhwa. There are reports that some independent candidates in Balochistan, Khyber-Pakhtunkhwa and Federally Administered Tribal Areas tried to buy honour through cash. Senate election-2012 was the first contest in which the contenders had to submit an affidavit that they don’t posses any other nationality. If proven wrong, they would lose their seat. 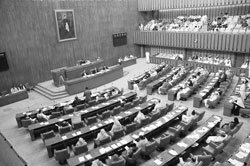 Another trend in the Senate election was the candidature of three sitting members of the National Assembly (Nuzhat Sadiq, Hameedullah Afridi and Munir Orakzai) and half a dozen members of provincial assemblies (Sardar Zulfiqar Khosa, Mohsin Leghari, Kamran Michal, Raheela Durrani, Robina Irfan and Nasreen Khethran). In this way, there have to be a series of by-elections for the national and provincial assemblies and replacements through the party lists for reserved seats for women and minorities. Kinship factor also played well in the election. Osman Saifullah, son of Anwar Saifullah, member Khyber-Pakhtunkhwa Assembly, won a seat from Islamabad. Senator-elect Khalida Qureshi is wife of PPP MNA from Muzaffargarh. Though Awami National Party denied ticket to veteran politician Begum Nasim Wali Khan, her brother Azam Hoti, father of Khyber-Pakhtunkhwa Chief Minister Amir Haider Hoti, remained lucky. While picking up the candidates for the Senate election, Pakistan People’s Party had to face cracks and dissidents in Balochistan, Khyber-Pakhtunkhwa and Punjab. Its senior vice-president from Balochistan, information secretary from Punjab and a leader from Hazara resigned from the party offices. Among the longest-serving outgoing members are Senator Waseem Sajjad who remained in the House for 27 years since 1985 and Prof. Khurshid Ahmed who served the Senate for 24 years. Similarly, the representation of about five political parties namely — Pakhtunkhwa Milli Awami Party, Jamhoori Watan Party, PPP-Sherpao, PML-Likeminded and Jamaat-i-Islami — has come to an end for the time-being. Unfortunately, the outgoing senators also became victim of a smear campaign during the last few weeks of their term as they bargained hard to get their lapsed development funds worth Rs360.61 million during the passage of the 20th Constitutional Amendment. These funds never went into the pockets of the legislators and were given to respective departments to fund development schemes identified by these senators. The curse was introduced by economist Dr. Mehboobul Haq in 1985 to gel MPs’ support for the military regime. The subsequent political governments continued the odd practice that not only earned bad name for politicians but also reduced the role of federal and provincial legislators to that of local councillors poking their nose in service delivery. The successful conclusion of Senate elections amid numerous controversies reflects that at least electoral democracy is gaining ground in the country.